Ok now when it comes to social media I didn’t think they come much geekier than me, but this just takes things a step too far. Upon saying “I do” Dana Hanna pulled out his phone to announce his new status on Facebook and Twitter. I dread to think what he tweeted before consummating the marriage! Hi Gem! My friend passed your blog link to me. I just started blogging about being married to a geek. My husband is a computer geek, I am no where close to that but I love social media. 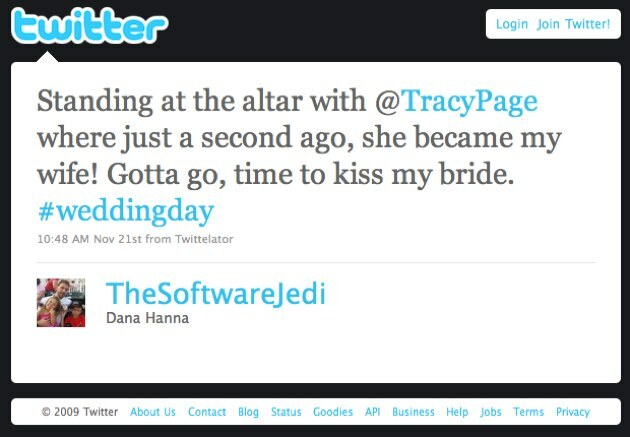 We got married in June 09 and our wedding was somewhat as geeky as yours! We didn’t tweet but my husband developed a micro blogging site and we blogged our way through the wedding :) I am so glad we did. It’s so much fun to read them now. I’ll keep an eye out for your posts!